The Ford line of cars was updated in 1937 with one major change — the introduction of an entry-level 136 CID (2.2 L) V8 in addition to the popular 221 CID (3.6 L) V8 unit. The model was a refresh of its predecessor, itself based on Ford's V8-powered Model 40A and was the company's main product. It was redesigned more thoroughly in 1941.The cost was $850 in the beginning of production. 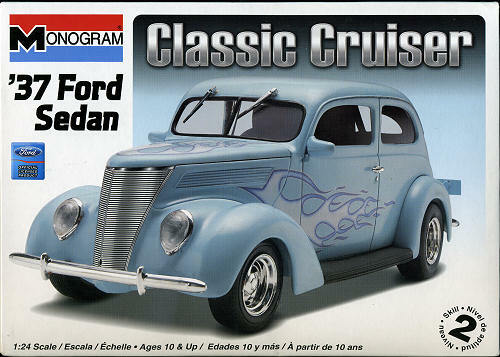 The 1937 Ford featured a more rounded look with fine horizontal bars in the convex front and hood-side grilles. The front grille was V-shaped, rather than following the fenders into a pentagon shape, as on the 1936 model. Faired-in headlights were a major modernization found on both the Standard and DeLuxe trim versions, though much of the rest of the design was shared between Ford's two lines. 'Slantback' sedans gained a rear trunk door, though space was limited, and 'Trunkback' versions continued gaining sales. I picked up this one hoping that one could do a stock 37 Ford, but it seems that this was never molded to be a stock vehicle. Dated 1994, this is a reissue in Monogram's Classic Cruiser series, which I assume to be all mild customs. The kit is nicely molded, though I did find a touch of flash here and there as well as some overly large ejector pin marks on some pieces. The marks should be easily removed or hidden in construction. A sprue of nicely done chrome parts and four rubber/vinyl tires along with a clear sprue of windows and such are also included with the usual white plastic sprues. As is expected of these sorts of cars, there is a big block V-8, which, with the distributor to the rear, I have to assume is a Ford. The kit has more modern seats and steering wheel for the interior. I found it interesting that the hood just fits atop the engine compartment with no hinges. There are two options. One is the choice of using bumpers or not. The second is standard running boards or custom ones of sheet steel with no treads. Instructions are well done with clearly drawn construction illustrations and color information provided as the build goes along. 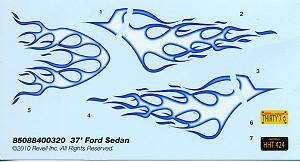 There is a decal sheet that includes flames, and license plates. I am sure that rod builders will be pleased to see this one return to the store shelves. It looks like a very straight forward build that should result in a very nicely done model car.